There’s a popular new segment springing up. Compact SUVs are a hot commodity, suiting buyers who want the efficiency of a passenger car and the function of an SUV. Ford has released an all-new model that fits those car shoppers perfectly, the 2018 Ford EcoSport. Its name tells you what it’s all about: economical and fun to drive, and obviously, built Ford tough. You can find the all-new 2018 Ford EcoSport in Port Alberni at Van Isle Ford Sales. It’s a new model for Ford, and it comes at the perfect time. The 2018 Ford EcoSport arrives just as the compact SUV market is heating up. There are four trim levels to choose from – S, SE, Titanium, and SES – meaning you’ll get the right fit for your needs. It has attitude too, available in 10 popular and bold colours including Canyon Ridge, Ruby Red, and Blue Candy. Because it’s meant to be an efficient alternative to a midsize SUV, the Ford EcoSport has two economical engine options. And making it more versatile than a compact car is a spacious interior and available Intelligent AWD. When you sit in the 2018 Ford EcoSport, you’ll forget it’s classified as a compact anything. The Ford EcoSport feels open and airy with amazing visibility all around. The SE, SES, and Titanium trims are equipped with a power moonroof for even more natural light and fresh air. There’s room for up to five people inside the 2018 Ford EcoSport’s cabin along with nearly 21 cubic feet of cargo behind the rear seat. Or, if you need to haul more cargo, fold down the rear seat and open up 50 cu. ft. of carrying capacity. How’s that for a ‘compact SUV’? With four different trim levels, there’s one that has everything on your wants and needs list. Standard equipment for the 2018 Ford EcoSport includes sport fabric upholstery with bucket front seats, rearview camera, air conditioning, and SYNC with a 4.2-inch display. Stepping up to the SE trim includes SYNC 3 connectivity with a 6.5-inch touchscreen display, Apple CarPlay and Android Auto, Reverse Sensing System, heated front cloth seats with 6-way power adjustment, and a power moonroof. 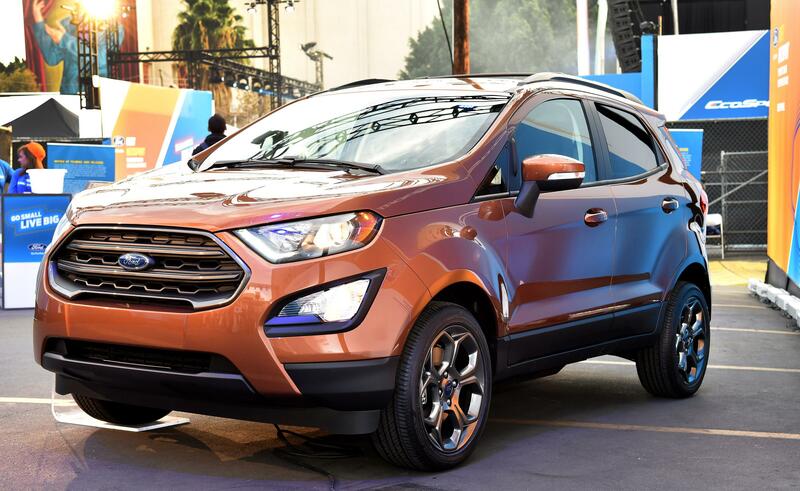 The EcoSport Titanium and SES trims add B&O PLAY Premium Audio, leather-trimmed seats, an 8-inch touchscreen, SYNC Connect, a Wi-Fi hotspot, voice-activated navigation, and more. Driving has to be fun, and the Ford EcoSport makes sure it is. The 2018 Ford EcoSport has two sporty options available. On all Ford EcoSport S, SE, and Titanium trims, Ford’s 1.0-liter EcoBoost inline-three is used. It makes 123 horsepower and is paired with a smooth and efficient 6-speed SelectShift automatic transmission and front-wheel drive. On the Ford EcoSport SES, the game changes. You’ll find the 166-hp 2.0-liter Ti-VCT four-cylinder under the hood, along with the same 6-speed SelectShift automatic transmission. It’s paired with Ford’s Intelligent AWD system, making short work of dicey road conditions. The all-new 2018 Ford EcoSport is the right combination of function and sport. If you’re looking for a compact SUV that is efficient and fun to drive, check out the new Ford EcoSport at your local Ford dealer in Port Alberny, BC, Van Isle Ford.